Fact or Fiction- Flea and Tick Edition! We all love snuggling on the couch with our furry family members, but what happens when your big ball of fluff rolls over for a belly rub, only to reveal a tiny little tag-a-long scurrying across Fluffy’s “sweet spot”? Unfortunately, fleas and ticks are a year-round problem here in the DMV, and they leave our pets (and their families) susceptible to several medical issues. Want to avoid the headache of flea and tick-related diseases? Read on as we present to you: Fact or Fiction- Flea and Tick Edition! 1) Fleas and ticks not only spread disease, they can cause secondary health problems for my dog or cat. While you may know of fleas and ticks as the biting pests that can put a damper on those fun-filled hikes in the Shendandoah, these pests also cause infection and other health problems. Ticks carry infectious diseases such as Lyme, Anaplasmosis, Ehrlichiosis, and Rocky Mountain Spotted Fever, which can lead to joint pain, fever, and systemic illness. 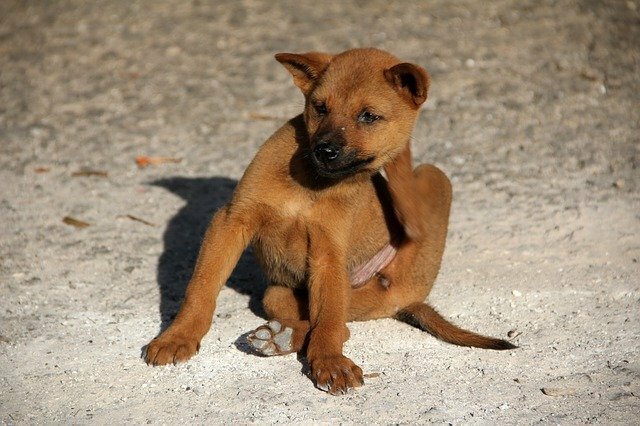 In addition to spreading disease such as Bartonella or “Cat Scratch Fever”, fleas can cause anemia (a low red blood cell count), and a skin condition called Flea Allergy Dermatitis (FAD). 2) Flea and tick-borne diseases can be easily prevented with the use of monthly flea and tick preventatives. Several products exist to prevent fleas and ticks for your pet. While there are variations as to the mechanism of action, method of administration, and length of effectiveness between products, these products are safe and effective when used as directed by your veterinarian. These products exist for both dogs and cats and include flavored chewables, topical liquids to be placed on the skin, and long-acting collars! 3) My dog/cat is an “indoor only” pet, so he/she doesn’t need any flea or tick preventative. Unfortunately, even our “indoor only” pets are susceptible to fleas and ticks. These pesky pests do not stop at the front door, and can be picked up on even the briefest of trips outside! Indoor pets can be exposed to fleas and ticks from other household pets that may venture outside, and fleas and ticks can even be brought inside by members of the family. The brown dog tick, the carrier of Rocky Mountain Spotted Fever, can even reproduce and live indoors! Talk about a home invasion! 4) My pet only needs flea and tick preventative during the warmer months, so I don’t need to use it during the winter. While the activity of fleas and ticks certainly slows during the cooler months, the risk for pets is far from over. Due to the unpredictable weather here in the DMV, fleas and ticks can remain active during all 12 months of the year. Unfortunately, patients have come to us with fleas and ticks even in the coldest months of the season, which is why here at FAH we recommend flea and tick prevention all year round! The key point to remember when using flea and tick preventatives is that while the product IS toxic to the PEST, it is NOT toxic to the PET. Not only are doses within these medications extremely low (we are trying to kill something smaller than the head of a nail, after all! ), they are made to affect the body system of a completely different type of organism. While each and every medication holds the potential to cause an adverse reaction, these events are extremely uncommon among our “veterinary approved” flea and tick preventatives. While adverse reactions tend to occur much more frequently with “off brand” or “generic” preventatives, the veterinary products recommended at your pet’s veterinary visit have been generally well-tolerated by dogs and cats. 6) My veterinarian can help me determine an appropriate flea and tick prevention protocol for my pet(s). Any of our veterinarians would be happy to advise you regarding the appropriate preventative product for your pet! Want to learn more? Call us at 703-820-2557 with any questions regarding the specific flea and tick preventative products that we recommend, or to schedule an appointment to discuss an individual plan for your pet!